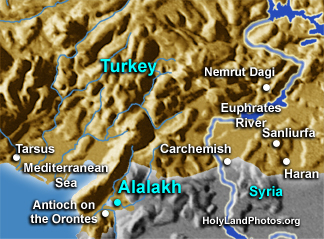 Alalakh (Tell Atchana/Aççana) is a 54 acre [22 ha.] mound that is located in the southern portion of the Amuq Plain approximately 12 mi. [20 km.] east of Antioch on the Orontes and 30 mi. [47 km.] east of the shore of the Mediterranean Sea. This important site was excavated by Sir Leonard Woolley and more recently by K. Aslihan Yener on behalf of the Turkish Ministry of Culture and Tourism and the Mustafa Kemal University in Antakya/Hatay. It was an important center from roughly 2200–1200 B.C. The architectural finds as well as large and small finds (including over 550 cuneiform tablets) are abundant! For additional information visit the official Alalakh web site.